Graham County was created on January 30, 1872, from a portion of Cherokee County to make enforcement of the law and access to the courts more uniform and accessible for the families who settled in the mountains of Western North Carolina. The county was named for William A. Graham, a Senator who helped get the bill through the Senate to create the new county.Graham had an active life of public service in addition to his service as state Senator. He was Speaker of the House of Commons, Governor of North Carolina, Secretary of the United States Navy, Senator of the United States and of the Confederate States, and a nominee of the Whig Party for the Vice Presidency. Long before European settlers in Graham were given the responsibility of governing themselves, these mountains and valleys were home to large settlements of Cherokee Indians who cultivated corn and other crops to supplement the bounty of fish and game found in this land ringed by four mountain ranges and the Little Tennessee River. 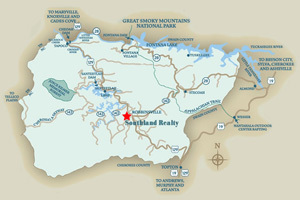 A large portion (68%) of Graham County is located within the boundaries of theNantahala National Forest, which is administered by the United States Forest Service. This allows residents and visitors the opportunity to hike in some of the most beautiful woodlands in the Eastern United States. Hiking trails abound in all parts of the county. There are over 40 trails varying in scenery, terrain, and degree of difficulty. The trails range from mountain top panoramas to lake side vistas. You may choose a 30 minute stroll with the family or, for the more adventurous, there are abundant wilderness areas for extended backpacking trips. So, whether you are a day tripper or a rugged outdoorsman preparing for the Appalachian Trail, Graham County has a trail to satisfy your needs. The Unicoi Mountains, part of the Great Smoky Mountains, form the western boundary between Graham County and Tennessee. The Snowbird Mountains run between the Unicoi Mountains and Red Marble Gap at the western entrance to the Nantahala Gorge, then swing north to Cheoah Bald. The Snowbird Mountains form the southern boundary of Graham, separating the county from Cherokee County. The northern section of the county is crossed by the Cheoah range and the Yellow Creek Mountains, and stretches to the middle of the Little Tennessee River and Fontana Lake where Graham and Swain counties meet. The Little Tennessee flows west from North Carolina into Tennessee and Alabama on its way to the Mississippi River and the Gulf of Mexico. The rugged nature of Graham County has been largely responsible for the slow development of the county from its earliest days. Today, it is the only county in North Carolina without a four-lane highway. Graham’s isolation is part of its charm and its strong sense of community.